VMware today used its Q4 2014 earnings call to warn its revenue growth will slow because it's doing so well in the cloud. The overall picture is rosy for VMware, which announced a US$1,703 million quarter and $6.03 billion dollar year, up 15 per cent and 16 per cent respectively on the corresponding periods from 2013. Other highlights from the quarter include the NSX network virtualisation business cracking the 400-customer, and $200m a year, barriers and featuring in nine out of ten new $10m deals closed last quarter. One financial services company has even spent $10m on NSX alone. VSAN is doing well, having racked up its 1000th paying customer and AirWatch is humming along at $200m a year of sales. The Reg's virtualisation desk has been waiting for some time for VMware to offer a number of some sort to describe the performance of its vCloud Air cloud efforts. That number finally arrived today in the form of the mention that hybrid cloud and software-as-a-service accounted for five per cent of Q4 revenue, or about $85 million. Virtzilla's put vCloud Air, AirWatch-as-a-service, desktop-as-a-service and vRealize as a service into a bucket to come up with that number. Intriguingly, CFO Jonathan Chadwick warned that the expected fast growth of those products negatively impact VMware's growth in 2015. 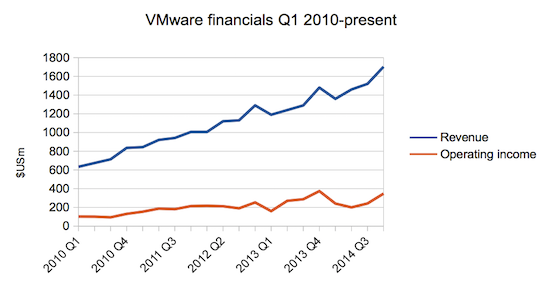 The reason is simple: The Reg understands VMware customers who buy licences pay every two years. But SaaS revenue, or cloud server rental, dribbles in rather than arriving in lumps. Chadwick therefore predicted revenue would cop a one per cent hit from the shift to the cloud, plus another two points as customers stop buying licences and start using SaaS. He also predicted another two or three points of pressure thanks to the strength of the US dollar, as deals written in other currencies now return fewer greenbacks. Another telling moment in the earnings call was the mention that VMware has participated in a substantial sale that involved all other EMC Federation members. The deal sees VMware software run on VCE hardware, using EMC's ViPR, Pivotal's development kit and professional services from the lot. Mentioning a federation-wide deal in an earnings call could well be interpreted as riposte to those activist investors who feel spinning out VMware would enhance the value of parent company EMC and stop the two competing. Overall, however, the news is good: guidance of ten to twelve per cent growth for 2015, which would have been twelve to fourteen were it not for the greenback, for a 2015 revenue number of somewhere between $6,640 and $6,760. Markets seem happy enough with this result: VMware shares are up a couple of points in after-the-bell trading.